A playing card stamped with Dad’s business information, 1980s. 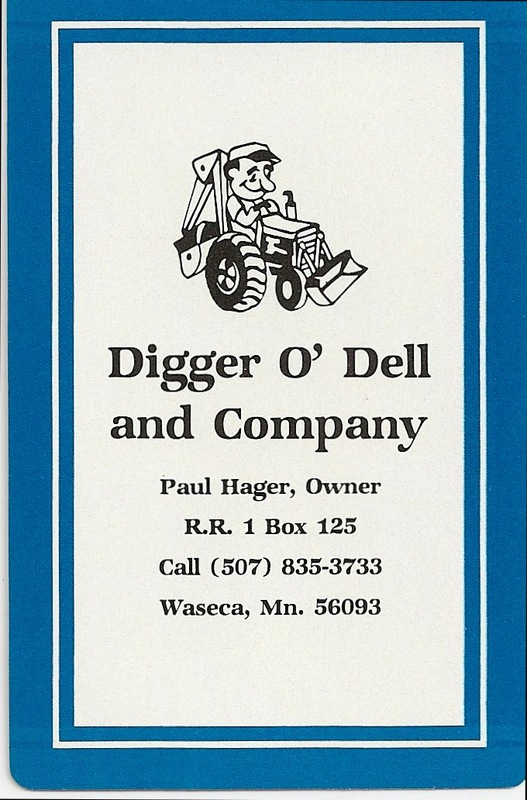 I like to think if Dad were still alive, he would have a website for his gravedigging much like the Leisingers, who run Bubba’s Digging out of Sioux Falls, S.D. Dad advertised his business through the means available to him in the 1980s–by printing his name and contact information on pens, notepads, mugs, hats, and playing cards. He handed these out to friends, family, neighbors, strangers. It may seem a little odd that gravediggers would need to advertise their business–after all, it’s not like someday they won’t have work. In Waseca, Dad didn’t have any competition. For him, advertising was a way to generate goodwill. The Leisingers do other digging work with their equipment, so the website is a good way to advertise that type of work. Dad also did some excavation work with his backhoe–digging trenches, foundations, etc. Check out Bubba’s Digging website–it’s clear they do good work, which is important to gravediggers who care about their business. The cemeteries they work in look neat and clean, and it appears they don’t leave a mess behind. I love that the matriarch had started work as a gravedigger in the 1950s–what a story!